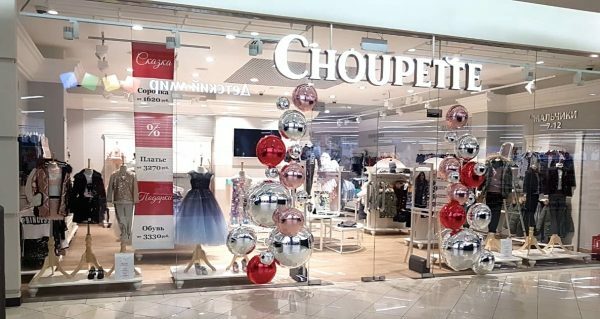 Choupette introduced a new store concept. The first store of the new format opened in Kazan on December 1st . The change in the format of retail stores is associated with the active growth of the brand in every aspect: the range matrix and age group have increased. The size range of fashion-collections, according to numerous requests from Choupette clients, in 2018 has grown to size 152. The new concept implies the interior of stores in the neoclassical style - a large amount of light and space. The basic color has changed: colder bright shades are dominating. The main becomes a combination of white and gray, which is directly associated with elegance and calmness. One of the main changes is also the increase in the store space and the emergence of new commercial equipment, which allows you to form clothing sets and show how things fit together. In the central part of the new store, there is a large-scale art object - a three meters in diameter styled carousel in the form of a suspension. Not only this attracts the attention of visitors, but also creates an associative link with the old concept, in which a styled carousel was used as a magnet. The interior now not only helps to demonstrate the range, but also becomes more selling. Initially, TM Choupette began development as a shop for kids up to 3 years old. Now the key audience of Choupette has become tweens from 8 to 12 years old. Marketing research of the target audience of the brand showed that sales in retail stores do not inferior and even exceed online purchases by 63%. Since it is important for buyers to evaluate in person the quality of the goods and try things on while buying children's clothes. The majority of Choupette respondents note that the main trigger for brand attraction is a wide and varied range that allows you to collect a complete image in one store and save time while shopping. The brand listens to its customers and annually analyzes and expands its product range, for example, for the AW 18/19 season, Choupette has released membrane shoes and thermal underwear for newborns.